This is my summary of day 1 of the In|Vest 2015 Conference. This is the first year for this conference and they are targeting a wide audience, at least beyond what I see at other wealth management events. Their goal was to bring together traditional wealth management firms, retail and private banks with enterprise technology and service providers, digital advisory and PFM platforms and venture capital and private equity investors. I think they succeeded, based on the people I have been running into and the packed room for the general sessions. As a strategy consultant, I help clients to enhance their wealth management tools and platforms to leapfrog their competition. So, when I browsed through the agenda, I was looking for speakers and panel subjects that were different from every other conference. It seemed though In|Vest had those differentiators. Especially with their emphasis on ‘disruption’. Whether they succeeded in delivering on their promises is another story. I was made it over to the Hilton a little late, since I had to finish up a client meeting. When I got to the second floor, I ran right into April Rudin who was prepping for her session on Social Networks for Investing with the guys from Vetr.com and Openfolio. See my writeup below. They recently announced a partnership with Orion Advisor Services to offer advisors access to an online advisory service that will be tightly connected to Orion’s portfolio accounting product. I see this as a shrewd move since Orion is gaining significant wealth management marketshare. A.T. Kearney is a consulting firm that has done some research on the potential for consumer adoption of digital wealth management services, better known as ‘robo-advisors’. This research includes identifying the characteristics of consumers most likely to adopt robo-advisory services, forecasting investment asset flows to robo-advisors, and assessing the potential impact of robo-advisors on the existing investment landscape. I’d like to know how they phrased this question. I’m sure they didn’t use the term ‘robo-advisor’, since it’s industry jargon. 20% of consumers, as opposed to current investors, is higher than I expected. I would say 2-3 years. The rate of adoption of services delivered via the Internet (also referred to as cloud-based) has been increasing over time. The time it takes disruptive ideas to reach critical mass of users has been decreasing. April Rudin referred to this slide as a “transformational moment”. 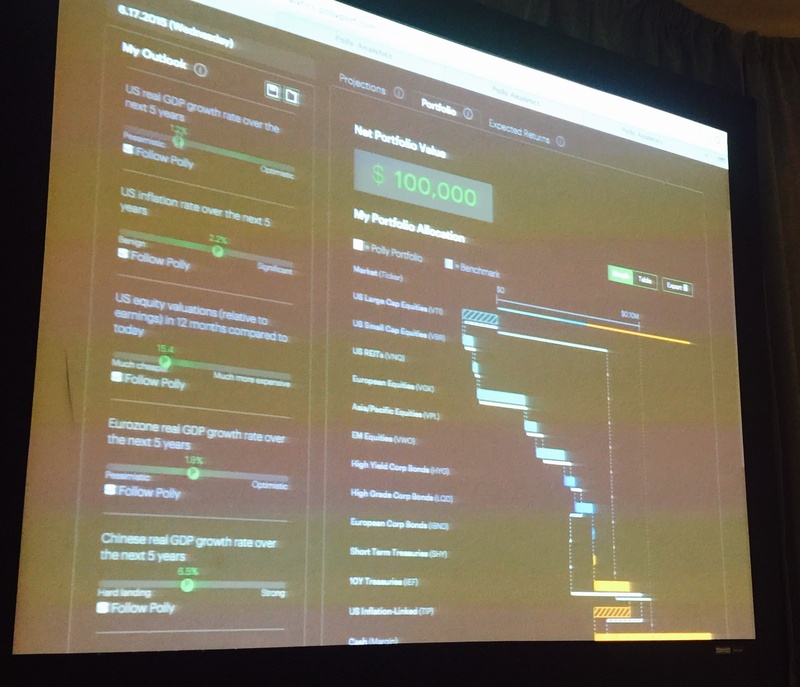 A projection of robo-advisor AUM with the word ‘trillion’ in it sent shock waves through the room. Betterment has pulled in over $1 billion in the past year, which sounds impressive until you realize that it took Vanguard less than five minutes to get the same amount into their online advisor service. You can also throw in the words automated, electronic, and mechanized. What Makes Digital Advisor Clients Click? Couldn’t they find another robo-advisor for this panel? There must be 100 of them now. I’m sure someone would have paid the fee to be on stage. Or maybe they were all afraid they couldn’t stack up next to Bo Lu? This is a useful observation that comes from analyzing a lot of data on investor behavior. I’d like to hear more of this from other presenters. Motif's Hardeep Walia proclaims at #InVest2015 about Robos charging high fees: "95 bps is not disruptive, it's just a cute UI." Walia was referring to Personal Capital’s AUM fee, which is out of line with the rest of the robo-advisors at 95 bps. Bill Harris defended his company’s fees by pointing to their hybrid model, where customers can speak to an actual advisor on the phone. But when Vanguard launched Personal Advisor Services with basically the same thing for only 30 bps, you have to wonder how long Harris will be able to hang on. There is already a robo-advisor that uses their ability to auto-hedge as part of their service pitch. They’re called Hedgeable. I need to find out more about how Motif plans to do it, but it seems that people are paying attention to the stratospheric valuations of the S&P500. Investors switching to robo-advisors are buying at the top. What happens when the bottom falls out of the market? I wasn’t too keen on the idea of vendors standing on stage and giving demos at a conference. Isn’t that what the booths are for? There were six vendors scheduled for a 45 minute session, which didn’t sound like a lot of time for each one. Sort of like elevator pitches at VC or incubators, I guess. They wound up starting half and hour late, so people were getting restless by the time the first presenter stepped to the stage. Each vendor was supposed to speak for only five minutes, but some pushed this to almost ten, since there didn’t seem to be anyone there to cut them off. How about a giant hook that would come out and drag the offenders off? First up was Brad Matthews, Founder & CEO, Trizic, Inc. They offer a digital investment advisory platform with both investor and advisor-facing interfaces. I like their UI, which is slick yet still simple to navigate most functionality. They keep it very simple. There are only two options for rebalancing; frequency and a percentage trigger limit. They recently raised $3 million in seed funding from Operative Capital. They launched their service with connectivity only to TD Ameritrade. Once they got some traction, they needed to get access to the other big RIA custodians. I’m guessing they will announce Pershing and Fidelity as their next two custodians. Just a hunch since both have been active in the digital space. I don’t know how to measure how much of the process is being automated. But any wealth management platform should be able to automate a lot of previously manual processes. This isn’t anything new. How their automation, U/X, workflow compares to their competitors is what’s going to matter in the end. Funny things happen during live demos. Matthews was trying to show how easy it was to add a button to a hypothetical bank’s website to allow prospective customers to open a new account. However, he had trouble saving the HTML file, which was rejected the first two or three times with an error. He did recover gracefully and the button magically appeared on the sample website, which he gratefully clicked and walked us through a few steps of their process. It looks very simple to use and could be a tremendous benefit to firms that want a quick way to digitally enable their client on-boarding process. Ummmmm… ok. He’s entitled to his opinion. But there is more money to be made from the robo-advisor business model paradigm shift than straight AUM billing. I just loved this picture! I couldn’t resist using it to go along with his quote. I agree wholeheartedly with Ritholtz on this one. Vanguard is an asset-gathering machine and is leaving everyone else in the dust. But not because they are doing anything unique. They only offer four funds! But they have the Vanguard name and they leverage it and their existing client base very well. They also set the price in the market for human-enhanced online advice at 30 bps. Hear that Personal Capital? I think the idea behind Vetr.com is fantastic. Crowd-sourcing equity investing. Yelp! for the stock market. I also love the name. It gives them wide latitude to expand into ancillary markets. Almost any product or service can be ‘vetted’. Mutual funds and other publicly-traded investments are ripe for the picking. How about insurance products and annuities? Possible. Not as exciting as stocks. Talking to their CEO Williams, I asked if they were working on an algorithm to generate a rating for individual equities based on the crowdsourced opinion? This would be something they could sell like Morningstar ratings. He said it is one of the four revenue models they are considering for 2016. During the session I signed up for a Vetr.com account. They can’t have a lot of users yet, considering that I was able to score the username ‘Craig’. Their UI has a social media feel. Like a Facebook news feed combined with a portfolio dashboard. 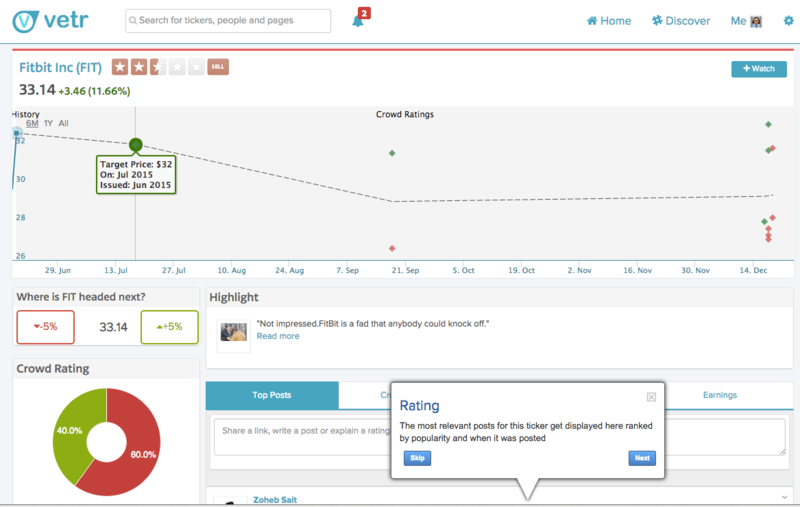 You can search for a stock and see what looks like a standard page of with a chart and other data. Until you see that they overlay the crowdsourced projections for where the stock is headed in the next six months as well as a buy/sell rating. What’s missing is how many people have contributed to the projections. I think you would need hundreds or thousands of opinions to smooth out the data and get an accurate prediction. Openfolio seems like a Motif clone to me. Individual investors sharing their portfolios. Not to say that there isn’t room for more players at this early stage. But I doubt there will be more than one firm standing in this niche in a year or two. They have added some new features to differentiate themselves. A partnership with Betterment allows users to open an account simply by clicking a button from the Openfolio site. A more interesting idea is being able to buy individual stocks that are recommended by other Openfolio users. 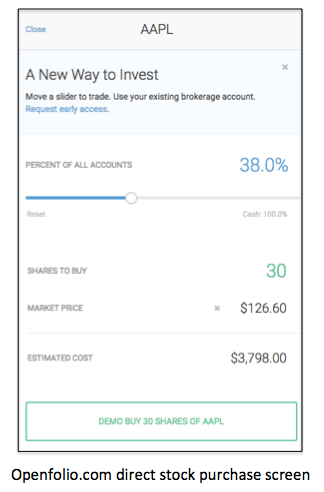 Based on the demo screen on the right, they will link to your existing brokerage account, similar to FutureAdvisor, and allow you to do what we used to call ‘order blasting’; buying the same stock across many accounts. This kind of computer-assisted, self-directed investing could attract users away from the robo-advisors. Not surprising no one is going to the teller window anymore given the incredible shift to mobile banking that has taken place over the past five years. But I would have expected more than 20% of deposits to be made via mobile. This is counter-intuitive. It may be due to the simpler user interface associated with bi0metrics. Everyone has a finger! You won’t see the same adoption of smartphone-based apps with seniors as Millennials. James Carney, Head, ByAllAccounts & RIA Software, Morningstar, Inc. These breakout sessions were too short! By the time everyone got seated and the panel started, it seemed like it was halfway over! It felt rushed. I would have like to have one less breakout session and give more time to go in-depth with some of these companies. The ability of advisors to charge a fee for advice on assets that they do not custody has always interested me. This has been one of the sales pitches of aggregation software but I had never heard any data to back it up until now. This seems more reasonable to me. Not sure what I would say if my advisor tried to charge the same fee for ‘advising’ me on assets he doesn’t directly manage. However, it is a tremendous new revenue stream that most advisors aren’t taking advantage of. A good first day was had by all. Saw lots of people I know, so SourceMedia must have done a good job of marketing and getting the word out to wealth management industry influencers. I recently attended a pharmaceutical conference and they had specific sessions dedicated to matching startups with venture capital firms as well as established players looking to invest. I wonder how many deals will be made as a result of meeting here?